Hanes & Bartels take a practical, common-sense approach to all matters, and are experienced in contracts, whether it contracts formation and drafting or contract disputes. While all parties to a contract go into the deal with the optimism that no problems may arise in the future, if the contract is drawn with an eye to the many possible contingencies and problems that could arise, if those problems do occur, they are addressed in advance, and expensive or protracted litigation can possibly be reduced or eliminated. 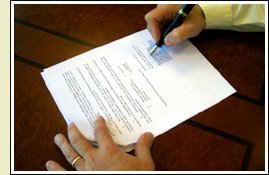 Contract Disputes: Most business disputes, and many other disputes, involve interpreting or upholding some kind of contract or agreement. We have represented clients involved in a myriad of contract disputes and litigation for decades.